crossing dragons is not recommended. Posted on December 25, 2013 by Elizabeth B.
Merry Christmas from myself and my dragon friends! Everyone celebrates Christmas with slightly different traditions and beliefs. Your favorite part might be the decorating–the filling of your home with the soft glow of Christmas lights and warm scents of a myriad of Christmas goodies. It might be the big gift exchange that your kids (or you!) have with all the cousins. Maybe you simply love to have your family close at this time of year, or maybe you’re aching because they aren’t there. It snows where you live, or it doesn’t, but whatever the weather is like, you love it for being Christmas. For myself and millions of other people around the world, Christmas commemorates an event from long before good old Saint Nick entered the scene: the birth of Jesus, who came to show humanity the way back to God. You’ve probably heard the story and seen the manger scenes many a time (if not, you can check out the original story here), but did you know there’s another version of the story–one with a dragon in it? 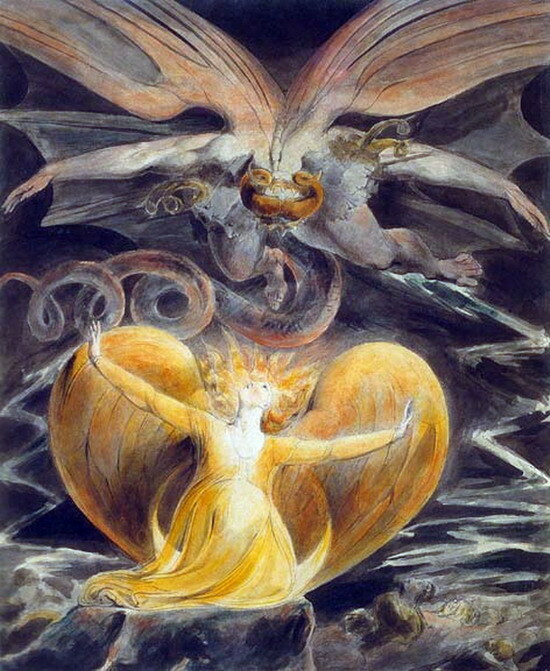 William Blake’s depiction of the woman being protected from the dragon in Revelation 12. Image taken from Wikimedia Commons. The dragon version of the Christmas story is found in the book of Revelation at the end of the Bible–a book that isn’t even read by many Christians because of its confusing prophesies and cryptic language. Whether or not you read, understand, or believe it, it is a beautiful book in some parts, including the the twelfth chapter, which is where our story takes place. This story portrays Israel as the woman, Jesus as the male child, and Satan (the Devil) as the dragon. The story jumps around a little bit in the chapter, but goes something like this: The dragon and his allies cause a great war in Heaven and are ultimately thrown down to the Earth. The dragon tries to kill the child that will one day mean his doom, but fails in his efforts. When God protects the woman and child from his attacks, he wanders off to harass the rest of humanity until the child grows up to destroy him. That’s a rough paraphrase. Whatever you believe about God, the Devil, and Christmas, you should read the story for yourself here. The symbolism is lovely–and who doesn’t want to read about a dragon on Christmas? The dragon loses. We win. Enjoy the story, and enjoy the holiday! Happy Birthday to Dungeons and Dragons! Hiccup and Toothless Are Coming Back! Get dragons in your inbox.